Heart block refers to a condition when your heart starts beating too slowly – it is also called bradycardia. The condition is caused by the blockage of the electrical signals that tell your heart to contract – the blockage may be partial at times and is between the lower and upper chambers of your heart. It is sometimes refers to AV block and it could be of varying degrees, including 1st degree heart block, 2nd degree heart block and 3rd degree heart block. Keep reading to learn more about heart block, especially the 2nd degree heart block. Why Does Heart Block Happen? An electrical signal starts in your heart's upper right chamber called the right atrium, which creates the heartbeat. The signal originates from an area of specialized cells called the sinus node and then moves to the atrioventricular (AV) node, which is another cluster of specialized cells. The AV node plays a role in slowing down the electrical current before sending it to the lower chambers of your heart through special fibers – that's why it is also called an electrical relay station. The blockage in any part of your heart may stop the signal from reaching to different parts of your heart, causing an irregular heartbeat, which is referred to as heart block. In 2nd degree heart block, the AV node takes much longer than usual to send the pulse to your ventricle and you will notice a skipped heartbeat. At times, some signals even can't reach the ventricle and under this conditions ventricle may lose contract and can't pump blood to the rest of your body. A 2nd degree heart block is further divided into the following two sub-types. In this type, the electrical signal will be delayed further and further with each subsequent heartbeat. At one stage, a beat will fail entirely to reach to the ventricles. This may cause dizziness and some other symptoms too. If you have normal conduction system, you may have type 1 2nd degree heart block when you sleep. In this condition, some electrical signals will never reach the ventricles. Compared to type 1 2nd degree heart block, type 2 is less common but it is more serious and often develops into third degree heart block. In these circumstances, you need immediate medical intervention. Your healthcare provider may also recommend a pacemaker to treat this condition. 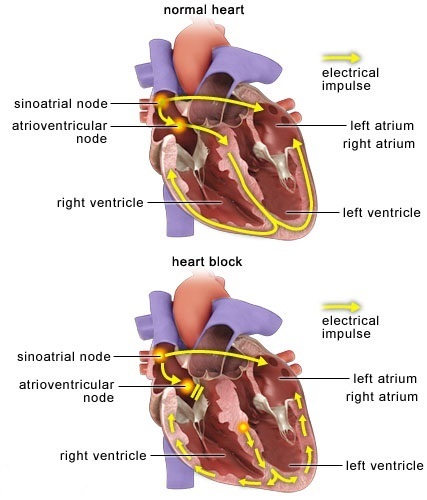 As mentioned already, heart block can be divided into different stages. Except for 2nd degree heart block, there are 1st degree and 3rd degree heart block you should know. In this condition, your electrical impulses will slow down considerably as they pass through the conduction system. However, the impulses do reach the ventricles, so you don't often notice any symptoms or problems. Well-trained athletes often develop this condition, but certain medications can also cause this. You usually don't need any treatment for this type of heart block. Also called complete heart block, the condition refers to the blockage of signal, which prevents any electrical impulses to reach the ventricles. The ventricles may try to generate some impulses on their own if they don't receive any from the atria. These are called ventricular escape beats, the heart's naturally generated backups, but they are very slow. You will experience symptoms like fatigue and lightheadedness in third degree heart block. Note: When the electrical impulses slow down as they pass through certain conducting tissue in the ventricles, the condition is called bundle branch block. If you have heart block, no matter it's 1st degree heart block, 2nd degree heart block or 3rd degree heart block, you must want to know how to deal with this situation. Actually, you don't always need a treatment for heart block, especially when there are no symptoms or the symptoms aren't that serious. They aren't life-threatening in most cases. But acquired heart block may needs treatments. Transcutaneous pacing (TCP) is a treatment option used for pacing the heart. It involves applying pads to your chest and passing electrical pulses to stabilize your heartbeat. This restores and maintains your normal heart rate. You may have to use a permanent pacemaker, which is a small battery-operated device inserted under the skin of your chest, to send electrical pulses to your heart.